Godliness and Contentment…two of the most important steps we can take towards eradicating the covetous tendencies we have for worldly gain that ruin our intentions to save or live on less and rob us of our joy. Life is never found in things but there are good things in life. Creative ingenuity can be the tool you use to fill life with joy and beauty when your heart is set deep in a foundation of godliness and contentment. There are so many blessings a joyful, creative spirit can bring to a home. A well placed bowl of flowers brightens a dreary corner, warm and inviting books stacked on a table create coziness , a fresh coat of paint applied to a worn piece of furniture makes it take on new life, warm baked goodies draw family members and friends to the kitchen for fellowship…. I am sure many of you ladies are already listing off the numerous ideas you have for brightening life. Today though, here is an idea for cheering up your wardrobe…specifically your toes. Although the joy of beauty can be turned into vanity and we should be wary of such a thing; it is a joyful thing to be feminine! So enjoy the below idea/tutorial, knowing that it embraces the principal of using our money wisely and celebrates the beauty of being feminine….right down to our feet. Plus it might just make the perfect handmade Christmas gift (my favorite kind)!! I suggest purchasing a pair that is on sale, so if your first try doesn’t succeed it is not upsetting for emotions or budget. 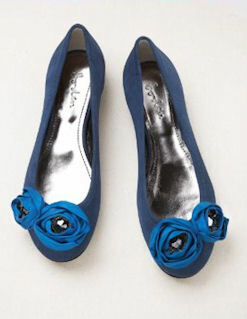 Or better yet dig out an old pair from your closet and rejuvenate them! My little slippers came from Walmart and cost $5.00. Perfect for experimenting on! Pick a color that you feel compliments the shoes you have chosen. I have lots of scraps and I managed to find what I needed here at home. You might too! You can choose anything that sparks your imagination and can be sewn or glued. I pulled mine off an old sweater that I felt needed different buttons anyway, thus saving on that expense. 1 large and 1 medium sharp hand sewing needles. I recommend a coordinating color to help everything blend in a pleasing way. Also quilting thread is more durable, so if you tend to be hard on your shoes, opt for the stronger thread to ensure that your embellishments aren't wilting by the end of the day. 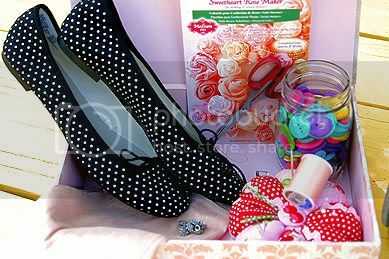 To get this exact look I recommend the Sweetheart Rosette Maker. You can probably find them at your local fabric or quilting shop. I used the small and medium patterns for my project. If you do some research you can find many ways of making your rosettes that do not require this basic pattern. Here is a free tutorial on how to make these sweet things…. 1. Collect all your supplies and set up in a pleasant location. A small table or flat surface is helpful. I chose my favorite picnic table since the day was lovely and it seemed a shame to be stuck indoors. I needed two rosettes for each shoe. One medium and one small. I recommend making all the rosettes you will need before continuing on to the next step so you can size and shape them to match. This is the most important part (and longest) of our project. Be sure to take your time and just enjoy the fun. Being in a hurry will not help your work and you want your rosettes wrapped tight and secure to ensure they look great, wear well and are easy to attach. 3. 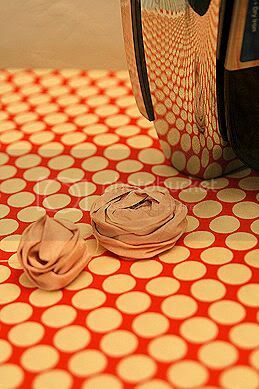 Once your rosettes are finished according to your instructions, take them to the ironing board. Turn them upside down and iron them, pressing down until they smooth out. 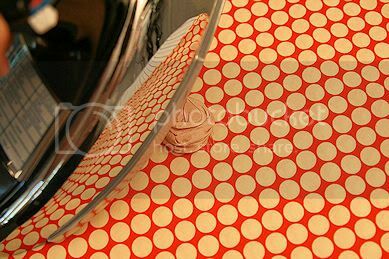 The pictures below show ironing in progress and a before and after rosette. 4. 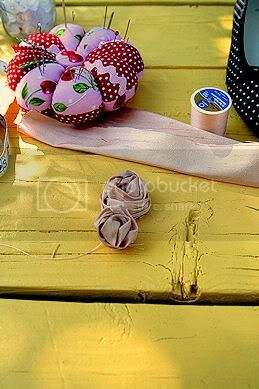 Back at your work station , pull out your needle, thread and scissors. Thread the needle with a long length of thread that is still manageable and tie the two ends together. So you now have a big loop of thread and your needle won’t fall off the end of your thread. Trim off the excess thread below the knot. 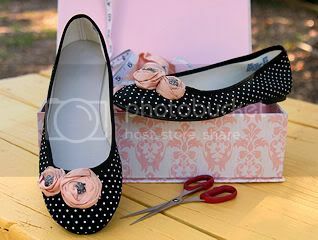 Insert the needle down through the center top of the larger rosette and then place the rosette on the shoe, inserting the needle into the shoe. 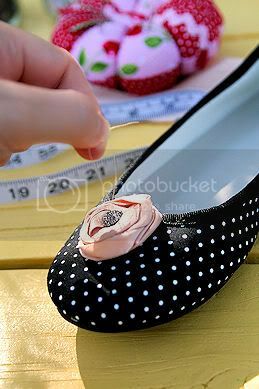 Pull your entire length of thread through until your rosette is pulled snug against the shoe. Then insert the needle through the shoe continuing back up through the center of the rosette, attaching the rosette to the top toe of your slipper. Pull threads tight as you sew in and out of rosette and shoe. Thread is shown loose here for example purposes only. Also put that thimble on your thumb! I forgot mine and regretted it! 5. 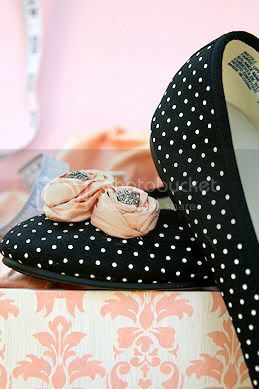 After sewing in and out of rosette and shoe 2-3 times take the button or embellishment of your choice and place it in the center of your rosette, sewing through embellishment, rosette and shoe centers 2-3 more times to attach it firmly. 6. Pull needle and thread up through the top of the rosette. Cut thread 3-4 inches from the base of the shoe. Tie of with a basic square knot (what you use when you tie your shoes) three times, pulling it snug and tight down into the rosette so it is not visible and snip/remove remaining thread above the knot. Arrange folds around center embellishment. Don’t be afraid to tweak it. It will be marvelous! 7. Now place your smaller rosette next to your first and attach it in the same manner. Be sure to place it on the outer side of the shoe so it will not get bumped like it would on the inside, where your feet brush against each other. Repeat the above steps to complete decorating your other shoe. I can’t wait to start my next pair! The possibilities are endless…just have fun! I assumed you wouldn’t need an iron or scissors. 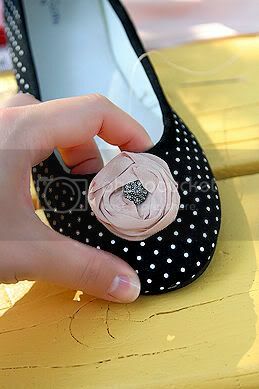 Wrap your own rosettes and use a pair of shoes from your closet and you only spend $10!!!! Now that is a number I can smile at every time I look at my toes. 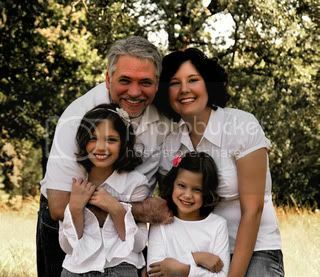 Nicole lives in Texas with her family and enjoys creating a colorful and joyful environment in and around her home.